IBM® DB2® Version 11.1 for z/OS® (DB2 11 for z/OS or just DB2 11 throughout this book) is the fifteenth release of DB2 for IBM MVS™. It brings performance and synergy with the IBM System z® hardware and opportunities to drive business value in the following areas. The DB2 11 environment is available either for new installations of DB2 or for migrations from DB2 10 for z/OS subsystems only. 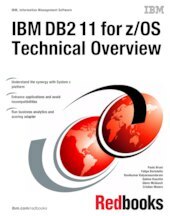 This IBM Redbooks® publication introduces the enhancements made available with DB2 11 for z/OS. The contents help database administrators to understand the new functions and performance enhancements, to plan for ways to use the key new capabilities, and to justify the investment in installing or migrating to DB2 11.